with both new buildings being completed simultaneously in 2017 or 2018 ..."
MoMA expects to have the building demolished by the end of this year. When a new home for the American Folk Art Museum opened on West 53d Street in Manhattan in 2001 it was hailed as a harbinger of hope for the city after the Sept. 11 attacks and praised for its bold architecture. Now, a mere 12 years later, the building is going to be demolished. In its place the adjacent Museum of Modern Art, which bought the building in 2011, will put up an expansion, which will connect to a new tower with floors for the Modern on the other side of the former museum. And the folk museum building, designed by Tod Williams and Billie Tsien, will take a dubious place in history as having had one of the shortest lives of an architecturally ambitious project in Manhattan. MoMA officials said the building’s design did not fit their plans because the opaque facade is not in keeping with the glass aesthetic of the rest of the museum. 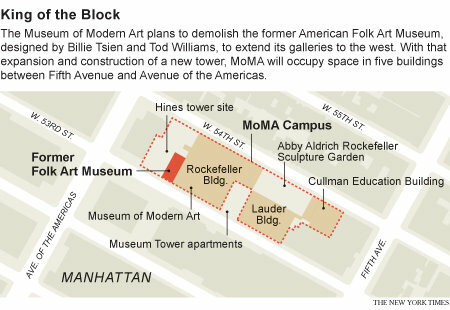 The former folk museum is also set back farther than MoMA’s other properties, and the floors would not line up. “It’s not a comment on the quality of the building or Tod and Billie’s architecture,” Glenn D. Lowry, MoMA’s director said. Mr. Lowry personally went to the architects’ offices to inform them of the museum’s decision, a gesture that Ms. Tsien said she appreciated. acclaimed when it opened 12 years ago, is going to be demolished. 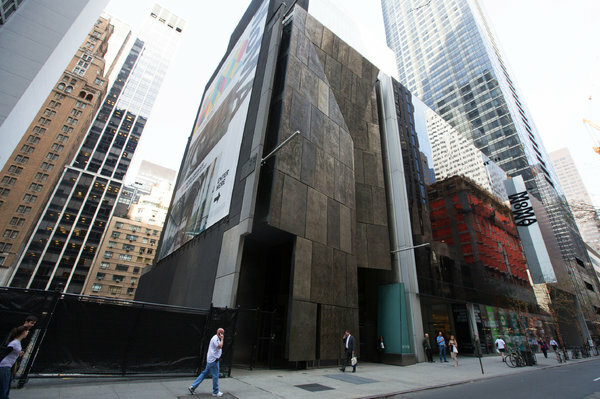 The folk art museum, which had once envisioned the building as a stimulus for its growth, ended up selling the property, at 45 West 53d Street, to pay off the $32 million it had borrowed to finance an expansion. It now operates at a smaller site on Lincoln Square, at West 66th Street. 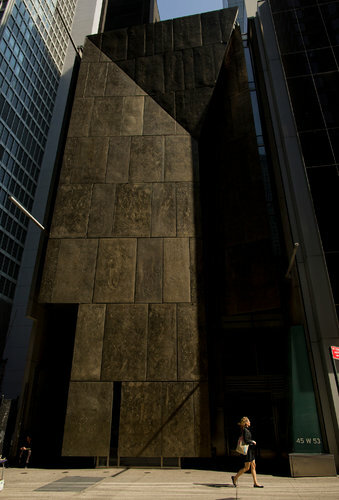 Mr. Lowry said the expansion would complete the MoMA campus, which will ultimately consist of five buildings, four of them on West 53rd Street between Fifth Avenue and the Avenue of the Americas. Still to be built is an 82-story tower just west of the folk museum that is being developed by Hines, a Houston company, and was designed by the French architect Jean Nouvel. It will include apartments as well as exhibition space for the museum. The cost for the project has not been announced, he said, and fund-raising has yet to begin. MoMA’s 2004 renovation, designed by the Japanese architect Yoshio Taniguchi, increased the museum’s gallery space to 125,000 square feet, from 85,000 (and the overall size to 630,000 square feet, from 378,000). But the museum still needs more room for exhibitions. Ms. Tsien said she and Mr. Williams, her husband, wished the Modern had found a way to reuse what they designed and to realize its value. The Modern will interview architects to design the new addition, Mr. Lowry said, and hopes to select one by the end of this year. It expects to have the building demolished by then. Construction of the Nouvel project is expected to start in 2014, with both new buildings being completed simultaneously in 2017 or 2018, Mr. Lowry said. The museum has been aggressive about expansion. In 1996 it bought the Dorset Hotel, a 1920s building on West 54th Street, and two adjacent brownstones, using much of the sites for its extensive renovation in 2004. In 2007 the museum sold its last vacant parcel of land for $125 million to Hines, which decided to develop the Nouvel building and include space for the museum. But residents protested the height and the Department of City Planning demanded that Mr. Nouvel cut 200 feet from the top. He did so, and in 2009 the City Council approved plans for a tower that is to rise 1,050 feet. Yes it's a nice little building but as I've said before, the traffic layout of the floor plan is awkward. It would be nice if the building could be rebuilt in a less vulnerable location. As a fairly new structure, the plans are surely still available. It sounds like the Verre, in fact, will be built. This is good news. Hopefully, something nice rises at 225 W 57th too. Both of them could draw attention from CIM's stick. Part of the reason I don't think 432 Park will be so bad is that it'll have taller company in only a few years. The original 1,250' Verre would've been even better, but 225W57th will dwarf 432 Park by at least 150 feet, probably 200-250... By the 2020s, hopefully it'll be a giant amongst many others, so it won't be THAT bad. I hope that you're right. Every time I've walked by, the concrete looked lousy. but 225W57th will dwarf 432 Park by at least 150 feet, probably 200-250... By the 2020s, hopefully it'll be a giant amongst many others, so it won't be THAT bad. 225 W57th will be about 3300 feet away from 432 Park. They won't be in the same dialog. You don't think so? The distance may be 3K+ feet but that isn't huge... certainly in skyline shots, they will be in the same 'dialogue'. & LL: agreed re 432 Park's concrete. Last update from YIMBY shows how the grey streaks aren't fading as hoped, despite the first exterior forms being poured 2+ months ago... I would think the curing process is complete, so the concrete will be permanently 'streaked'? If they fail to laminate/cover up the concrete, I think this could be quite the eyesore. The dialog as such that one won't dominate the other. The distance is a little more than that between ESB and Chrysler. You can't say that the ESB dominates Chrysler the way that 1 WTC dominates Woolworth. Looking at it from a different, er, perspective: In all Manhattan views east of 5th Ave, all of Brooklyn and Queens, 432 will appear taller. I agree. I walked by on the 56th St side about two weeks ago, and the concrete looked horrible. Mr. Kurtz would have been terrified. This is tough to judge based on the colors. While concrete typically reaches 90% of it's maximum strength in 4 weeks, it can continue curing for years. It's quite possible the building will continue to brighten for a very long time, similar to the patina that builds on new copper roofs/buildings in the city. That said, it might not, and they may need to consider a sizable Sherwin Williams order. The cost of this building nearly killed the Museum of American Folk Art. But somebody should preserve + re-use the great facade panels.